This show is not something we'd typically watch, but there was mention of RuPaul starring in it, so we gave it a shot. That doesn't sound like a great reason to watch anything, but hey we all have our priorities. Ours may involve the sassy and fabulous RuPaul Charles. I only wish he had a bigger role in the show. Girlboss is yet another book turned into a TV series. But we tend to pay a bit more attention when it's a Netflix show since their initial offerings were so strong that it's hard to ignore them entirely. And this was also a fairly popular book, albeit one I never bothered to read. The series has its charm and certainly appears to that desire to find your own path to success in this life using passion to drive you and sheer gumption to see things through. But at the same time it's not quite a path that is easily replicated nor is the lead character necessarily inspiring or anything along those lines. In that sense I suppose it truly is a real-life story for the most part - one that is generally true and not necessarily a good tale or bad one. Synopsis: Girlboss is a an American comedy TV series created by Kay Cannon for Netflix. 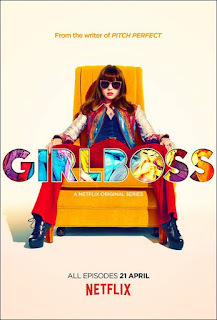 The show is based on the autobiography of the same name written by Sophia Amoruso, the woman behind the company Nasty Gal. The show was not renewed for a second season. It's 2006 and Sophia Marlowe (Britt Robertson) is struggling to make ends meet in San Francisco. She gets fired from her job and on a whim buys a vintage jacket at a thrift shop and manages to sell it on eBay for a heck of a lot more. This inspires her to start a vintage clothing business on eBay as her own business. What starts as her scouring second hand clothes shops on her own and making little tweaks to outfits before selling them on eBay leads to her eventually setting up her own website and pushing her business to a new level entirely. But before she can get there she needs to deal with all sorts of problems including an hernia, a budding romance which may or may not do well and of course her ups and downs with her best friend Annie (Ellie Reed). But Sophia is still young and impulsive and many times she's the source of many of her biggest challenges whether because of her mistakes or just her plain ignorance of the world of business and all that complications that come with it. What I Liked: Well, the show certainly has some great moments like the whole bit about the wedding dress and of course the opening bit about the jacket. In that sense it feels like the show had some great scenes that it probably derived from the book and it invested a lot of time and effort to bring them to life. And thus for those moments, things really fall into place well. The real-life depiction of the vintage clothing forum is one of the true gems of the show. Then you have the styling of the show, and I'm not just talking about wardrobe. San Francisco looks amazing in this movie and the color grading and tone for things feels like an Instagram feed on steroids. The show is way more beautiful than the clothes in this story even. What Could Have Been Better: I don't know what Sophia Amoruso is like in person, but Sophie Marlowe in the show is a terrible young woman who is not at all a likable protagonist. Whether this is by design or just how she was directed to act in this movie is hard to tell. Yes she has some compelling moments in the show that are quite impressive. But on the whole I'm not at all invested in her success since she's so distasteful as a person. The supporting cast is a weird mix of familiar faces in weird roles. It was sort of fun to see Jim Rash as a sassy thrift store owner and of course RuPaul as the cheeky neighbor person. But they're not quit utilized to their full potential and I don't see why they allowed that to happen. Such a waste of some interesting talent. Heck even Norm Macdonald felt like a waste. TL;DR: Girlboss had a successful book as a basis but it didn't quite translate along well. It has some very unlikable characters and it feels like a weird set of good sketches tied together with bad filler. Thus the show only gets 2 pseudo vintage outfits out of a possible 5.